Meinhardt UK, has rapidly expanded in the last few years as such we are continually looking at implementing strategies to support our business mission and values. We hold Corporate Social Responsibility (CSR) close to our hearts hence we want to incorporate the right strategy for the company. We have recently become members of the Heart of the City programme for 2019. Heart of the City supports businesses to set up responsible business activities and take them to the next level. They run regular training events, networking sessions and mentoring covering all you need to know about responsible business. We regularly work with contractors and clients and contribute employees at the events to raise money. 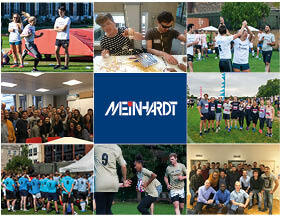 From supporting local rugby clubs, participating in charitable events and sponsoring elite athletes, Meinhardt is committed to engaging with and investing in our community wherever we work. Our employees take pleasure in giving a little back to those that we work with, and the communities that we develop, and this is what will keep the Meinhardt CSR program growing for years to come. We also support the development of engineering skills in young people through the STEM ambassadorship. For the last three years, we have hosted Meinhardt UK’s annual charity tournament which plays host to 10 corporate rugby teams from various companies across the construction sector, all of whom come together for an afternoon of friendly competition followed by a celebratory after-party. The aim of the tournament is to help raise funds for Homeless Rugby CIC, a charity that tackles homelessness through sport. Homeless Rugby believes that offering opportunities to regularly train and play rugby can inspire and empower individuals to realise their full potential, directly improving participants’ health, discipline, communication skills and self-respect.